Nepal is located in the Himalayas region bordered by India and China and considered one of the most geographically diverse countries in the world. Psychoanalyst, Sigmund Freud, speaks of places where you can lose your personal identity and get wrapped up in an “oce­anic feeling, similar to a spiritual experience”. On a clear morning, the scene of glistening Himalayan whitecaps in the backdrop of bright blue skies may well have you believing Nepal is that place he speaks of. Few countries have as diverse a landscape as Nepal's. Its narrow borders boast a complete range of climatic zones – tropical, temperate, alpine, and arctic. The high peaks create rain basins and rain shadows throughout the country, giving virtually every valley and gorge its own unique micro-climate. It is no surprise then that 10% of the world’s bird species are found in Nepal. That’s about 800 or so. In the south, the subtropical thick jungles play the sounds of deep growls from Royal Bengal tigers and the rumbling grunts from Asian single-horned rhinos. In the mountainous terrain, you’ll spot snow leopards chasing down throngs of golden-eyed blue sheep. Within Nepal’s incredible geography, you’ll also find a cultural landscape that ranks among the richest and most diverse in the world. The population of 29 million people is a potpourri of ethnicities and cultural sub-groups speaking a total of 30 different languages and dialects. Nepali is the vehicular language in Nepal, whereas the other languages are spoken by Tibeto-Burman and Indo-European families. Nepal is the birthplace of two major world religions, Buddhism and Hinduism, although the latter’s true origin is disputed. Both remain widely practiced in the country and both represent religions that have been superimposed on earlier Shamanistic beliefs. The country is home to several of Hindu’s sacred pilgrimage spots and is the setting for two great epics in the religion, the Mahabharata and the Ramayana. The “Buddha” or “Enlightened One”, meanwhile, was born in Nepal. His real name is Siddhartha Gautama and he was a prince from the southern plains of Lumbini. This 5th century BC founder of Buddhism gave up his royal life to become a meditating mendicant. Today, Buddhism remains strong in Nepal, especially in the Himalayan belt of the north. Nepalis are quite proud that their country managed to avoid colonial rule, a distinction few other countries in Asia can claim. For hundreds of years, Nepal was closed off to outsiders without exception. In fact, less than 70 Europeans were permitted to visit Kathmandu from 1881 to 1921 and they were prohibited from venturing into the valley. Times have changed. Today, Nepal welcomes a wide spectrum of tourists around the world – mountain climbers, religious pilgrims, expedition trekkers, liberal-minded hippies, and ordinary folks just looking to get a glimpse of the splendour of the Himalayas. 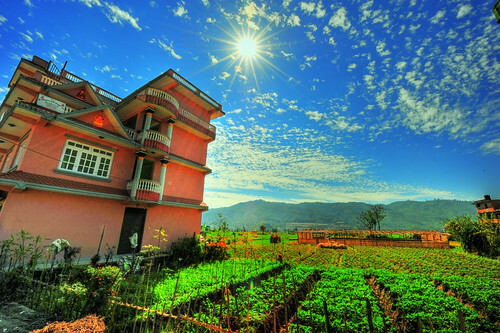 Many tourists also come hoping to find the legendary lost city of Shangri-la hidden somewhere in the mountains. But Nepal is hardly a utopia. It is one of the poorest countries in the world and has a per capita income of less than $300. Life is difficult for Nepalis, but most of them will tell you that they would never live anywhere else. One of the pleasures of visiting Nepal is meeting its people. They are friendly, patient, tolerant, and generous. Their society is pluralistic, making room for multiple languages, faiths, and cultures. When faced with challenges or setbacks, they are calm and patient. They are also a philosophical bunch, thanks to the influences of Hinduism and Buddhism in their lives. You’ll find yourself mimicking their qualities – patience, tolerance, humor – and it’s a good thing because things may not always go the way you’d expect traveling in a third world country. Overall, Nepal is a traveler's paradise. Where else can you raft down rivers fed by the Himalayas, ride an elephant while gazing at rhinos, trek down lush green slopes greeting mountain folks along the way, or break your neck looking up at the world’s highest mountain range, all in one visit? Nepal beckons visitors back, again and again, with its rich culture and the call of the Himalayas. Nepal encompasses a huge stretch of the Himalayas, the highest mountain range in the world, as well as several equally stunning peaks; in fact, eight of the world’s mountains over 8,000 meters are located within Nepal. Trekking is the main attraction of Nepal. The landscape and vegetation of the country is incredibly diverse; you’ll find wildlife reserves of lowland jungles in Nepal’s south as well as mountain tundra, deep valleys, streaming rivers, and desert stretches throughout. And, of course, everyone knows about the world’s highest mountain, Everest, which tower over Nepal’s horizon at 8,848 meters. Some of the popular treks include the Annapurna circuit; this is one of the treks most enjoyed by tourists. But it should only be undertaken by the relatively fit as it involves climbing up 5,380 meters over a three-week period; trekkers of this circuit, however, are more than rewarded with some of the world’s most breathtakingly diverse sceneries. The Jomosom trek, which takes ten days to complete, is a commercial route that nevertheless passes through many charming ethnic villages. And the Mount Everest trek is probably the most arduous. The trek leads to close-ups of the world’s highest mountain. The high altitudes, however, make it a strenuous month long expedition. Safari tours, bird-watching, and wildlife spotting are popular as well. The Chitwan National Park and the Bardia National Park, for example, both offer jungles with various wildlife like Bengal tigers, Indian rhinos, deer, elephants, and over 450 species of exotic birds. You can tour these parks by foot, jeep, or canoe. With Nepal’s many lakes and rivers, white-water rafting and kayaking are naturally both favorite activities among tourists. The Trisuli river and excursions in and out of Pokhara and the upper Kali Gandaki are great rafting and kayaking destinations. Nepal is also known for its many Buddhist and Hindu temples and festivals, including the Shiva Raatri in February and March, the Indra Jatra in August and September, and the Dasain in September and October. These festivals involve music, dance, drama, and yogic demonstrations. You can also enroll yourself in a Hindu or Buddhist school to learn more about the four truths, Tantra, or Shamanism. Many courses in meditation and yoga are also offered in the Kathmandu and Pokhara regions. You can also book an appointment with one of the many Nepalese practitioners of massage or Tibetan medicine. Nepal’s Himalayan region has been inhabited since the Neolithic age 9000 years ago. Indo-Aryan tribes entered the Kathmandu Valley around 1500BC and small kingdoms, clans, and tribes arose over the next several centuries, segmenting off various parts of the country. By the late 14th century, Nepal began to come under a unified rule, only to be carved out soon afterwards in the late 15th century into three rival regions: Kathmandu, Patan, and Bhaktapur. In 1768, King Prithvi Narayan Shah united the small principalities of Nepal and unified them into a kingdom, marking the birth of the modern nation. Nepal found itself engaged in a war with Tibet shortly after, which forced Nepal to retreat from the mountain passes and pay repatriations to China. In 1810, a war broke out with the British, namely the British East India Company. While Nepal initially held out, they eventually had to sign an agreement that ceded over all the territories to the east and west of its present borders, including most of the Terai, and Sikkim, in exchange for the country’s sovereignty. The loss of Terai land weakened Nepal. The country’s aristocratic rulers, the Shahs, had derived much of their income from the region. This led to a disgruntled aristocracy rife with factionalism and instability. The Shah court became mired in a tangle of plots and intrigues. In 1846, the Queen of Nepal’s lover was shot. Enraged, the queen ordered the gates locked and called out all the noblemen as well as the military leader, Jang Bahadur Rana, and his brothers. Shots were fired. In the aftermath, some 85-90 noblemen of the Shahs were killed, while the Rana brothers emerged relatively unscathed. The morning after, Jung Bahadur Rana became the Prime Minister of Nepal with autocratic control of the country. The Ranas in the ensuing century would become the autocratic rulers of the Nepal with the Shahs acting as puppet monarchs. The Ranas were very pro-British and assisted them in various wars. In return, the British formally recognized Nepal’s independence in 1923. In the late 1940s, the Nepalis who were unhappy with the selfish rule of the Ranas moved for democracy. India sponsored Tribhuvan as Nepal’s new king in 1951 and Tribhuvan in return promised democracy to the Nepalis. Unfortunately, he died in 1955. His succeeding son instituted a panchayat system which still governs Nepal today. Nepal had remained a closed country for many years and only started to open up to the rest of the world in the 1950s after the British withdrew from the region. Tourism emerged in 1989 when many restrictions barring several areas to tourists were lifted. However, the industry has declined as a result of the recent Maoist (communist) rebels’ battle against the government, which began in 1996. A ceasefire was instituted in September, 2005 which has brought a measure of stability back to Nepal, but it remains unclear how long it will last. Burbank, Jon, Rosha Bajracharya, and Kesang Tseten. Nepal. New York: Prentice Hall Travel, 1993. ISBN: 0671879138.